On Friday 28th September we will be holding a Macmillan Coffee Morning at The Pop In Place 10am until 12noon. We will have a Tombola a Bring and Buy stall , Cake Stall and a Raffle. Thank you to Stella who has made a beautiful patchwork cushion that is part of the raffle. There will be a warm welcome to all who attend to support this very worthy cause and if you are able to bring something along for the Bring and buy stall that would be greatly appreciated. We are holding a Charity Cabaret Evening on Saturday 6th October 7.30 at the Village Hall. We have some very talented acts for you to enjoy including Ballroom dancing, award winning young singer song writer Karl Lattimer, a variety of solos, duets and a choir number, comedy and instrumentalists. Tickets are £5 each and are available from Alison Bennett 01929 472023. The evening is in aid of the Stroke Association please come along and support this event. Sixteen years ago today Dr Harley opened a new village community group called the “Pop In Place” since then we have reached out to hundreds of people of all ages in various ways through the Performers Group the Poppets Group and the Community cafés and all of the events and we have raised thousands of pounds for worthy causes. Thank you to everyone who came along and supported the Happy Memories Morning at the Pop In Place today. 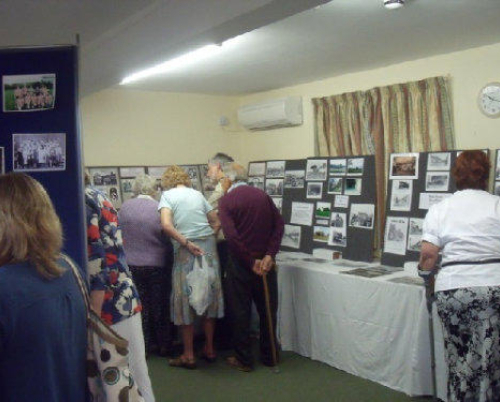 We had a great turn out for the Old Bere Regis Photographic Exhibition. Thank you to Paul and Mark Bennett for their photographs and to Dave ,Gill ,Julie and Sarah who helped to put up the displays. Paul has said that there were so many people who came in and found great enjoyment looking at the old Photographs, there were lots of people from outside the village that had once lived here or that had relatives from Bere Regis coming in with lots of stories and he had a wonderful time just listening to all of them. We as a family feel that it is lovely to be able to share our collection of old Bere Regis with many people who really do appreciate them and the Memory Cafe has given the perfect opportunity to do that. Thanks to both Lisa Holmes from the Age UK Memory Advisory Team who came along and gave a short talk about memory loss and to Keith from the PPG who has supported all the Happy Memories Cafe’s. Thank you to all the people who made the superb home-made cakes and to all the helpers who volunteered in whatever capacity. By either driving in visitors, welcoming people, serving teas, and clearing tables and washing up and also helping to pack up at the end. Special thanks to our young volunteers from the Performers Group who also took an active role in that and to our very young volunteer for her brushing up skills. Terry Bryant was great and really got everyone thinking about old theme tunes in his name that tune game and then there was all the old memorabilia that he has collected over the years, we ended up with a good old sing song. Needless to say Izzy the Pat Dog was a real hit with the people both young and not quite so young. Speaking to many of the visitors from other places they were quite amazed at the community spirit that we have within the village and how people all pull together to stage such and interesting and worthwhile event. Pictures taken by Claire Syrett .